We believe that active travel should be a realistic, normal, comfortable choice. Reduce traffic congestion by doubling cycling and walking in Crewe & Nantwich in the next ten years. Our routes will specifically target those roads which are congested at peak times. This will support the local economy by improving traffic flow for everyone. 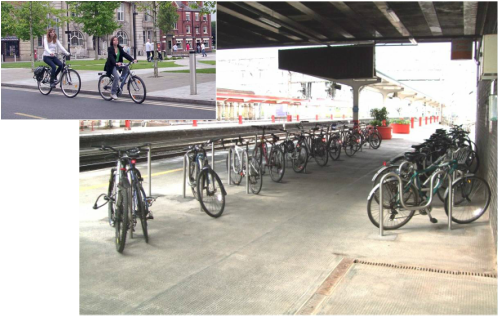 Crewe will have a network of direct, high-capacity, joined-up walking and cycling routes to link key destinations at strategic points in Crewe, e.g. MMU, the station, business parks, town centre, Leighton Hospital and Bentley. These routes will be supported by linking residential quiet roads. Ensure any new housing developments have access designed for walkers and cyclists. Make all residential and quiet streets 20mph limited. Create well planned Dutch-style, fully-segregated lanes and junctions; pedestrian crossings and vehicle free spaces, more mandatory cycle lanes, semi-segregated from general traffic. Create better places for everyone, regardless of travel choice. We will have green corridors, even linear parks, with more tree-planting, more space for pedestrians and less traffic. Cycling will promote community safety, bringing new life and vitality to underused streets. Cycling will transform more of our town into a place dominated by people, not motor traffic. This will also improve air quality and make roads safer and quieter. Increase the number of people of all ages who are out on the streets making public spaces more welcoming and providing opportunities for social interaction. The National Institute for Health and Clinical Excellence advises the NHS to promote active travel, proving it helps to reduce the risk of coronary heart disease, stroke, cancer, obesity and Type 2 diabetes. It keeps the musculoskeletal system healthy and promotes mental wellbeing. Leighton Greenway In Crewe comes tantalizing close to both the shops in Crewe town centre and to Leighton Hospital where some 2,000 people work. So instead of providing a perfect offroad path into town and to the hospital for thousands of people who live or work in the area, it's a route that starts no where and ends no where. So, by National standards, the Crewe still has an awfully long way to go. It has a handful of short segregated cycle paths none of which are linked to each other, making it impossible to travel safely across the town. But the decision about whether to Join-up these routes or to build new ones is yet to be made. You can help by writing to the Council and sharing with them your experiences of cycling/walking Leighton Greenway A simple email would help, just letting them know how much you value being able to use the route, how it's made your journey safer or faster or encouraged you to cycle more and leave your car at home. Improving safety for cyclists is a particularly hot issue for Cheshire East Council at the moment. The Authority knows it has a poor record in providing segregated routes for cyclists and this is the button you could push if you decide to write. Segregated routes allows adults and children safe and sensible routes from their homes to school, shops, and work. As evidence of our impartiality, in 2012/13 we have spoken to the Home Secretary and local MP, the Leader of the Opposition and the Labour candidate for Crewe and Nantwich. All backed active travel! and get news, views, and campaigns, plus the opportunity to make your opinions heard.